He was born on June 24, 1872, in Coffee County, Alabama. Married at a young age to Alice Mixon. Moved to Texas, back to Alabama, then to California and finally to Charlotte Harbor, Florida. Joined the Arcadia Police Department sometime before 1920 and eventually became Chief of Police. He became a federal prohibition agent in 1924. Agent Bowdoin was killed on February 16, 1925 in a shootout with bootleggers (Bernie Harris, Harvey Walker and Sumpter Harris). 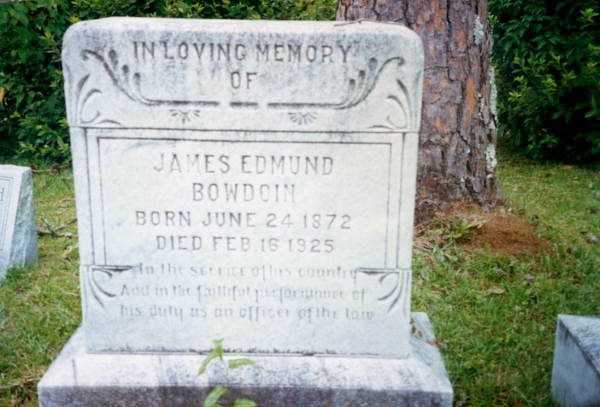 The name of James E. Bowdein (mis-spelled) is inscribed (East Wall, Panel 24, Line 2) on the National Law Enforcement Memorial in Washington, D.C.